Inspired by “Travelin’ Joe” Passov, I’ve been trying to come up with my own wish list of “Courses I Need to Play.” The fact that I’m having trouble finding ten testifies to how lucky I’ve been over the years. I’ve played Mollymook. I’ve played Formby Ladies. I teed it up in the inaugural event at Medicine Hole. If my current bout with tendonitis were to end my golfing days, I’d have no cause for complaint. Even higher on my list, maybe at No. 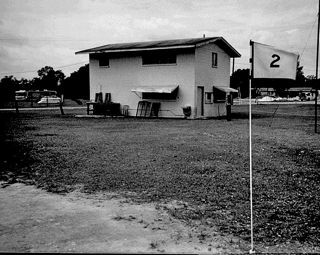 1, is the Fort Meade City Mobile Home Park Golf Course in Fort Meade, Fla. Fort Meade has finished dead last among the world’s courses in every Top 50 survey, a record not likely to be broken. On the other hand, it is the best 9-hole, par-3, clay-greens course in the South. I’ve walked Ft. Meade on a couple of occasions, taking in the surrounding banyan trees and fire-ant sand hills, but I’ve never gotten the opportunity to play. Just once I’d like to stride up that final fairway with a club in my hand, crossing in front of the tee boxes for the previous eight holes, and stepping onto the profoundly round and flat ninth green, at the foot of the municipal water treatment plant. Another not-to-miss track that I have toured without playing is the new Machrihanish Dunes course in Machrihanish, Scotland. While not exactly the black sheep of the Kintyre Peninsula, the Dunes course does have black sheep on the property, their job being to keep the marram grass on the dunes to a playable length. At 79 pounds per round in peak season, Machrihanish Dunes is the priciest layout on my must-play list, but I’ll claw back some of that by neglecting to leave any money in the honesty boxes of my other choices. I’m also pining for the Papa Westray Golf Course in the Orkney Isles of Scotland. Although panned by one critic as “worse than Ronaldsay,” Papa Westray provides tourists with the opportunity to experience the world’s shortest scheduled flight, a less than two minute hop from Kirkwall. But first I have to experience the Lost City Golf Course of Sun City, South Africa — if only to play the famous 13th hole, which is fronted by a stone pit full of hissing crocodiles. Well, I’ve got time to work on my list after dark — of which I’ve seen plenty this week, my four golf clubs having found their way to top-ranked Askernish Old in the Outer Hebrides. I’ll post my reflections on the world’s best golf course in a day or two, weather permitting. Top 50 on TV: I’m on an island in the North Atlantic. Ask a friend or check your local listings. John, you’re a certified golfnut for being in the Hebrides this time of year! I will say though, after playing Askernish in the middle of July with no one on the course then, that you’ll definitely have it to yourself. Be on the lookout for a Pro-V1 #7 I lost in the right rough on Runway about 100 yards short of the green. Cheers!